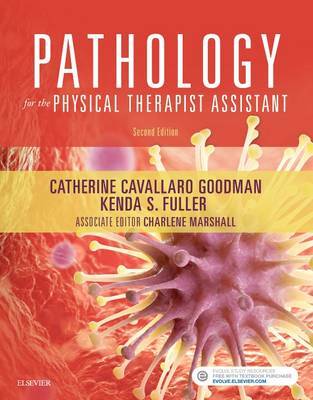 Understand the why behind diseases and disorders and how it affects what you do in everyday practice with Goodman and Fuller's Pathology Essentials for the Physical Therapist Assistant, 2nd Edition. This reader-friendly book serves as both a great learning guide and reference tool as it covers all the pathology-related information that is most relevant to what you, the future or practicing physical therapy assistant, need to know. Each chapter takes a well-organized approach as it defines each pathology disorder; describes the appropriate physical therapy assessments, interventions, guidelines, precautions, and contraindications; and rounds out the discussion with relevant case study examples based on established practice patterns. This new edition also features new critical thinking questions and clinical scenarios on Evolve which bring the material to life and help you see how the information in the book can be applied to the day-to-day work of a physical therapist assistant. PTA-specific information and reading level provides easy-to-follow guidance that is specific to the role of the PTA in managing patients. Special Implications for the PTA sections offer a starting point when addressing a particular condition for the first time. Medical management section addresses diagnosis, treatment, and prognosis for each condition discussed. Easy-to-follow, consistent format features a well-organized approach that defines each disorder followed by sections on clinical manifestations and medical management. More than 700 full-color images help?reinforce understanding of disease conditions and general pathology principles. Coverage of basic science information and the clinical implications of disease within the rehabilitation process gives readers a solid background in common illnesses and diseases, adverse effects of drugs, organ transplantation, laboratory values, and much more. Terminology and language from the Guide to Physical Therapy Practice is used throughout the text to familiarize readers with the standardized terminology that's used in practice. Abundance of tables and boxes organize and summarize important points making it easy to access key information. Twelve e-chapters offer supplemental information in the areas of behavioral issues, the gastrointestinal system, vestibular disorders and more. NEW! Clinical scenarios on the Evolve companion website look at patients who have variety of comorbidities and the many factors to consider when evaluating and treating. NEW! Critical thinking questions on the Evolve companion website help users apply the knowledge gained from the text. NEW! Vocab builders set the stage by framing upcoming information in the text.